I just made the eggplant lasagna and read that if you slice the eggplant the night before and layer it between paper towelling and put something heavy on top, then the eggplant slices will dry out. I did this and the slices were really dry and perfect to use in the lasagna. Apparently this idea came from an Italian boyfriend whose family in Italy did this. No, it will be very bland tasting. Blending the tofu with the seasonings makes it much more flavorful than just a slab of tofu would be. How about layering the tofu slices, rather than creaming them? Will itend up the same? This was absolutely delicious. I used fresh kale instead of spinach. I also cut the eggplant a bit thicker for a more pasta-like lasagna and cooked for around 50 minutes. Perfect! What a great recipe. Thank you! I didn’t have tofu on hand, so I substituted canellini and some other mixed white beans for the tofu. I overprocessed the spinach-bean mix, but my husband–the omnivore–thought it was just fine. We both thought the whole thing was wonderful. By the way, your recipe inspired me to cook and to use our oven for the first time in years. I’ll be making this again soon. Again, thank you. I just made this and it was delicious. I’m wondering why you couldn’t use silken tofu? I used half a package of firm tofu and half of silken tofu. I prefer the creamy texture of the silken tofu and next time I’ll use an entire package of.silken tofu and will peel the eggplant. I cooked fresh spinach and squeezed the water. My lasanga had the perfect moisture! Susan I just made this and it will now be on my list of go to meals. Delicious!! So I made this tonight with a few changes-used kale instead of spinach,added some mushrooms to the tomato sauce that gave some ground beef texture to the sauce. Came out great! Thank you sooo much for fabulous recipe! 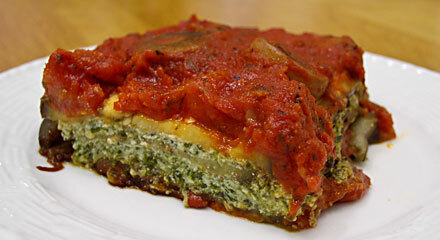 Now that’s a vegan eggplant lasagna recipe. I see so many recipes that say they are vegan and healthy yet they use white pasta and cheese. Your recipe is perfect. I’m making it tonight. Does anyone know if this can made a day in advance and refrigerated until it’s cooked the next day? I used this recipe for dinner tonight and it was great!! Thank you so much. It was a bit watery, but I can see where I can definitely adjust that the next time I make it. Thanks!! Just made this and it was delicious. It was a little watery but after I cut it and let it sit, then baked again to finish it off. It turned out great. I grilled the eggplant slices first and added a layer of mushrooms. Loved this. Next time I will add another thin layer of sauce , too. Thanks! This was DELICIOUS!! Easy to make, even for a new plant strong eater who is intimidated by tofu. I squeezed the spinach really well, patted the tofu, & made sure to let the eggplant sit and this kept the dish from being too watery. Looking forward to having it again. I may add some sautéed onions next time. I also want to try this with zucchini!! Thanks for a great recipe that I can’t wait to make for my meat-eating friends! I am not a very good cook at all. But I was determined to learn to cook healthier food. Thank you so much a great recipe! This worked! Love it! I live in Sweden and can only find firm silken tofu, will that ruin it? Also, my husband is allergic to garlic and onions so I’m hoping that removing those won’t leave us with a bland dinner. We’ve just finished dinner and I must say it was really delicious. I topped it with sliced tomatoes before baking and scattered the top with fresh basil leaves when serving which made up for the lack of spinach, but it was ok without as the sauce was well flavoured. Just reading the comments and I haven’t made this yet (but will for sure – looks delish), but I wanted to suggest that the reason for the wateriness might be from either not draining the frozen spinach, or using fresh, uncooked spinach. If you are using fresh spinach, you should cook and drain it first, because it has a lot of moisture. I always like frozen spinach for caseroles, because it is much easier to squeeze most of the excess moisture out. To cut down on the moisture, use extra firm tofu and press it first. My friend has also suggested freezing the tofu, then pressing to get better firmness. Try grilling the eggplant first it’s great and it will cut down on the watteriness. This recipe is fabulous. Because I LOVE LOVE Garlic and spices, I added a ton more garlic, fresh basil, oregano, thyme, and rosemary to the tofu. The dish was awesome and everyone loved it. A bit watery(which happens to my regular lasagna when I use cottage cheese over riccota) which I attribute to not totally soaking all the water from the eggplant but still delicious. Michelle, I haven’t tried that, so I will hope someone else has and will comment here. I think it will be best if made closer to baking, but it will probably be edible made earlier. Let’s hope someone else chimes in! I’d like to make this for a dinner I’m hosting on Thursday. Can I make it tonight (3 days early) and keep it in the fridge… baking it “day of” ??? I tried this last night and it was awesome! The filling was my favorite part, the tofu and spinach looked really appetizing, I compressed the tofu first to drain some moisture out. Thank you so much. I will have to experiment. I will most certain try it again. Congratulations on the new site it is looking great! Aleksandra, I’m sorry to hear that. It could be that your eggplant or tofu was very moist, but I just don’t know. I would say that if you try it again, use less sauce and maybe add a teaspoon of cornstarch to the tofu. Susan, I am going to try this tomorrow. It looks delicious. Thank you for the great new design of the site. You rock! Sounds like the perfect eggplant lasagna recipe!!! Can’t wait to try it!! Im going to try this this weekend. I have everything it needs, except for the spinach. Looks great – I’ve done something similar using zucchini sliced into flat strips and sauteed to heighten flavor, reduce moisture a little and the noodles weren’t even missed. BTW, best thoughts for new website. 158 calories, 3.1 gram total fat, 576g sodium, 747g potassium, 25.7g carbs, 8.1g fiber, 14.3g sugar, 8.9g protein, 2.6 ww points.